E.G.O Energy Regulators (series 50.57) has been developed to provide infinitely variable input control of single - circuit elements. Designed around the latest platinum substrate technology they are compact, high quality products for use in a variety of applications including microwave ovens, grills and hob units. Independent of the application the product dimensions and principal operation mode remain the same. The differing requirements for each application are met by the individual performance curves in each case. 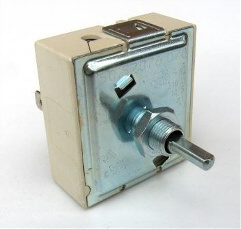 E.G.O Energy Regulators are provided with a snap - action switch actuated by a heated bimetal in the infinitely variable range settings. The switch periodically connects and disconnects the element. E.G.O's extensive range of energy regulators enables a variety of functions and features to be offered for example, energy regulators with automatic heat up or energy regulators with auxiliary switch for connecting the second circuit of double circuit radiant heating element. Energy regulators are voltage - dependent, i.e. they must be designed for the same nominal voltage as the appliance to be controlled. 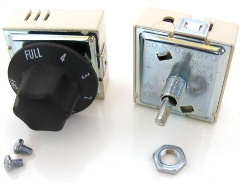 E.G.O Energy Regulators are available for all common main voltages. A code number indicates the voltage for which each version is designed. Therefore 50.57021.010 for energy regulator.